It’s all about the music. Baby (Ansel Elgort) pulls up to a bank, three robbers brandishing machine guns hop out, and Baby hits play. While waiting for them to grab as much cash as they can, he jams out to “Bellbottoms” by the Jon Spencer Blues Explosion. He’s having so much fun you almost forget that he’s waiting to flee a crime scene. The robbers hop back into the car, Baby hits play and then hits the gas. The right song is all he needs to stay focused and be the best as what he does: drive. That opening car chase scene contains all of the requisite moves that we have come to expect: hand brake maneuvers, dodging cross traffic, and escaping the police — but it also contains some welcome surprises. Baby surprises his fellow con artists with his talent, and also with his constant attachment to his iPod. They aren’t so sure they can trust him when he is always listening to music and doesn’t seem to be listening as they plan their next heist. As their mastermind, Doc (Kevin Spacey), explains, Baby was in a car accident as a child and has tinnitus, so he has to listen to music to drown out the noises in his head. It helps him focus. At another heist, the robbers delay in getting out of the vehicle so Baby has to tell them to wait for him to start the song over. Everything is connected to the music. The film’s title is taken from a Simon and Garfunkel song that seems to have been the initial inspiration for the film. The song however, doesn’t play until the final credits. A ray of light comes into Baby’s bleak criminal life when he meets Debora (Lily James), a waitress at a diner. He hears her before he sees her; she’s singing a song he has never heard of. Right from the start, they flirt like crazy and Debora even buys into his recording habit by grabbing the recorder and speaking into it. They discuss songs that include their names; Debora complains that there is only one song she knows of with her name in it, and she’s jealous that almost every song has “baby” in it. Soon they’re sharing earbuds as they wait for her laundry to dry. They flirt so unselfconsciously it’s intoxicating. Even though he’s a long wat from The Fault in Our Stars, Elgort still knows how to put on the charm and make the romance a highlight of this film. That being said, their romance still relies on a few clichés such as running away together to escape Baby’s criminal life. As Debora says, her dream is to “head west on 20, in a car I can’t afford, with a plan I don’t have.” How convenient. Baby not only listens to music, he makes his own. He carries a recorder with him and records snippets of conversation to later put to music. He records his fellow criminals talking about him, Debora talking to him at the diner, and anything he finds interesting. When his fellow criminals find out about the recorder, they have another lapse of trust. 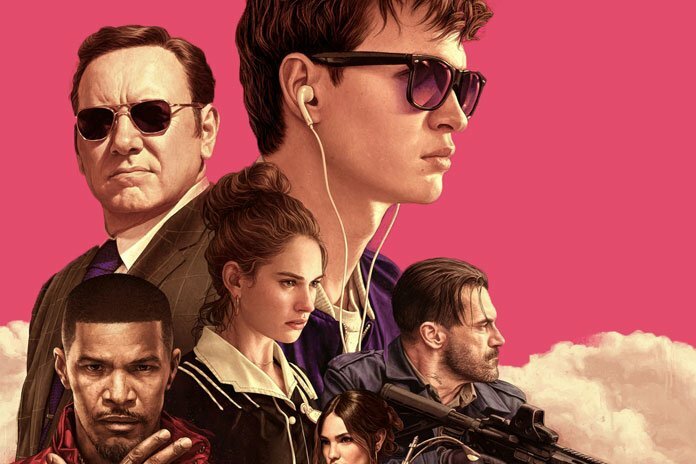 Eventually, Baby has to take on Buddy (Jon Hamm), his wife Darling (Eiza González), and Bats (Jamie Foxx) who each have their own crazy quirks. Among all the car chases and action packed heists, one of the best scenes is actually Baby walking down the street. He’s going to get coffee for Doc and the team, but with Bob & Earl’s “Harlem Shuffle” in his ears, he skips and glides along the sidewalk with the background matching his mood. Just as the song hits a glorious saxophone solo, he happens to be in front of a music store, and even the graffiti matches his mood and the song’s lyrics. It’s a very clever scene that exudes the confidence and swagger of this riveting film.